With growing data communications traffic, broadband radio communication systems such as radio-LANs, are being developed that employ various modulation formats. For example, IMT-2000 and other mobile communication systems already use multicarrier methods. Broadband radio signals are already being used in the RF band. To push this envelope for higher quality data transmissions, researchers and developers are studying higher frequency/broader band carriers. In this kind of radio communications environment, new measuring instruments are needed that are not only more efficient than ever, but also more flexible to support new test requirements and communication standards. The R3671 and R3681 are one of these new measuring instruments for this new era of test and measurement requirements. 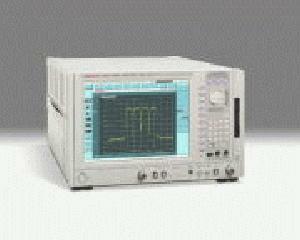 The R3671 and R3681 are high performance signal analyzers. Employing our unique RF technology, the R3671 and R3681 achieve an Average Display Noise Level of -158 dBm*1), a Third-Order Intercept Point (TOI) specification of +26 dBm*2), and a signal purity of -122 dBc/Hz*3) to enable measurements over a wide dynamic range. The R3671 and R3681 also have unique noise correction functions that enhances their dynamic range (–84 dBc [typical]) for W-CDMA adjacent leakage power (ACLP) measurements. The R3671 and R3681 come standard with broadband modulation analysis functions (bandwidth 25 MHz) as well as RF measurement functions. By adding the dedicated signal analysis options for the respective communication systems to the R3671/3681, you can expand the functionality of transmitter testers. Furthermore, with an optional RF signal generator that supports digital modulation, the R3671 and R3681 provide ease of implementation of the optimum testing systems for evaluating high-frequency devices.